Discipline for Teens: How Can I Get My Defiant Teenager Into Counseling? How Can I Get My Defiant Teenager Into Counseling? So you think your teen needs counseling ...but he/she refuses to go. What can you do? Counseling adolescents can be tricky business. Often times, when a therapist receives a call for help to counsel an adolescent, it is from an exasperated mother or father who no longer can tolerate the behavior of their teenager. The adolescent is presented as being “out of control.” There may be concerns of drugs/alcohol, poor school performance, or the influence of the peer group. The adolescent may be described as depressed, anxious, angry – or even suicidal. The parent usually wants the counselor to “talk some sense into their child.” The hope is that the counselor can wag an even bigger finger in front of the adolescent for an effect more profound than that of the parent – or miraculously get the adolescent to open up. But unfortunately, wagging fingers doesn’t work. If the adolescent isn’t talking to her mother or father, then dragging her off to a counselor as an agent of the parent likely won’t work either. If the adolescent does meet first with the counselor and does talk, what is often heard is a litany of complaints about the mom and/or dad. The counselor is next in the middle between parents and adolescent playing “he said - she said”. So what is a parent to do? 1. Moms and dads can provide a detailed description of their concern and the history of the problems. The counselor then has a broader perspective to understand the issues than what the adolescent would likely provide. 2. Moms and dads must understand that the counselor doesn’t live with the adolescent. The parents do. Even though the focus of what brought the adolescent into counseling may begin with his behavior and problems, at some point the counseling must take focus on a positive direction and look for solutions with parents as partners. The solutions should include not only what NOT to do, but include clear direction for what TO do. Dwelling on the problems will leave everyone immersed in the negative and living in the past. Re-focusing and developing positive strategies for improving relationships and behavior can redirect both parents and adolescent to positive ends. 3. Some adolescents (like grown-ups) view counseling as stigmatizing. The counselor may be able to avoid this by arriving at a clinical diagnosis of the problem. This means that on the basis of the parents’ description, the counselor may come to an understanding of the problem and can direct the parents accordingly. If the counselor can offer meaningful direction without even seeing the adolescent, then the adolescent may be spared feeling stigmatized. If need be though, the counselor can still meet with the adolescent directly. 4. The mother and/or father will have had the opportunity to check out the counselor and determine if they are comfortable trusting their teen’s care to this person. Not all counselors are alike, and parents may prefer the approach or values of one counselor to another. 1. Determine if your adolescent needs to be seen in discussion with the counselor at the first meeting. If not, only the parents should attend the first counseling session. 2. 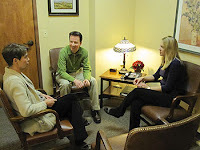 If your adolescent does attend counseling, your participation remains crucial. 3. After determining and addressing the problems, the focus must shift to positive working solutions that are “future-oriented” and facilitate parent-teen relationships. 4. Remember the goal: Relief from distress and well-adjusted adolescents. 5. Remember: The counselor doesn’t live with your adolescent. Counseling may be directed to help parents guide, manage or influence their adolescent – even if the teen never attends a counseling session. Counselors who have experience and training with managing oppositional defiant behavior – and who understand the thinking that underlies this behavior – is the best option. Family therapy often assumes that the family is the problem, but it is usually the case that the family is the arena for change – it’s where change has to take place, and parents are agents of that change. This is why much can be accomplished when the counselor only works with the parents.